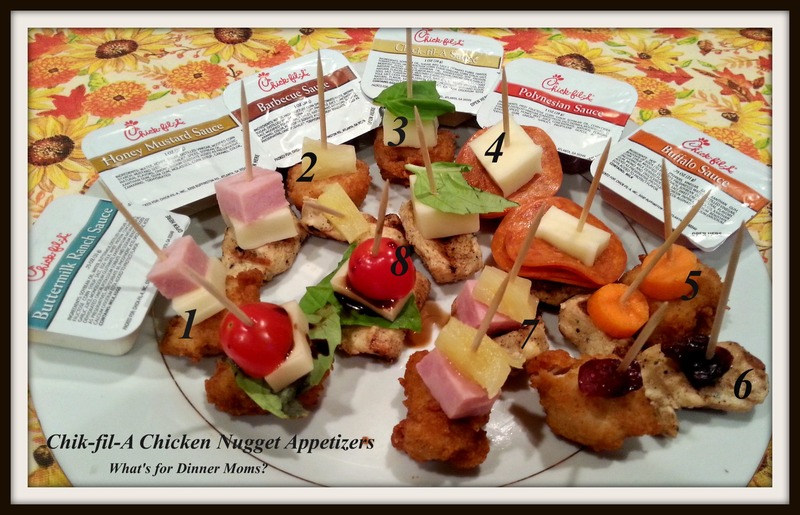 Entertaining with Chik-fil-A: Dress Up Your Chicken Nugget Appetizers – What's for Dinner Moms? The past two weeks have been extra busy around our house. Between visiting family, dance competitions, Halloween, decorating for Christmas (yes, I said Christmas!) and an impromptu party I felt I was going to fall down! Chik-fil-A to the rescue! We were challenged to create appetizers using Chik-fil-A nuggets for the #ChikfilAMOMS Club. My kids and I created 8 different bite size appetizers for everyone to try. They were a HUGE hit. Using just Chik-fil-As grilled and crispy nuggets combined with many ingredients we already had on hand at home, sauces from Chik-fil-A and a quick stop at the local market we were ready for the party. We created each appetizer using both crispy and grilled nuggets. They all tasted wonderful and everyone was able to choose which they preferred, crispy or grilled. 1. The Chik-en Cordon Bleu Bite – a chicken nugget, with a piece of swiss cheese and ham to be dipped in the zesty Chik-fil-A Honey Mustard sauce. 2. Terriyaki Chik-en Bite – a chicken nugget, a tidbit of pineapple to be dipped in your favorite terriyaki sauce. 3. Chik-en Parmigiano Bite – a chicken nugget topped with a piece of mozzarella cheese and a basil leaf to be dipped in your favorite spaghetti sauce. 4. Pizza Chik-en Bite – a chicken nugget with pepperoni slices and a piece of mozzarella cheese to be dipped in your favorite spaghetti sauce. 5. Buffalo Chik-en Bite – a chicken nugget topped with a slice of carrot to be dipped in the Chik-fil-A Buffalo Sauce and then in the Chik-fil-A Buttermilk Ranch Sauce. 6. Cranberry Barbecue Chik-en Bite – a chicken nugget topped with a dried cranberry to be dipped in the Chik-fil-A Barbecue Sauce. 7. Hawaiian Chik-en Bite – a chicken nugget topped with a piece of ham and a pineapple tidbit to be dipped in the Chik-fil-A Polynesian Sauce. 8. Chik-en Caprese – a chicken nugget topped with half of a grape tomato, a piece of basil and a piece of mozzarella that is drizzled with your favorite Balsamic Vinegar. All of the appetizers were a big hit. Everyone had their own personal favorites and it was lots of fun for the kids and I to create them. What can you create with your Chik-fil-A grilled or crispy nuggets?